Fetischismus: Grundlagentexte vom 18. 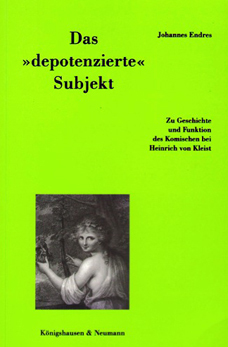 Jahrhundert bis in die Gegenwart (Fetishism: Source Texts from the 18th century to the present). 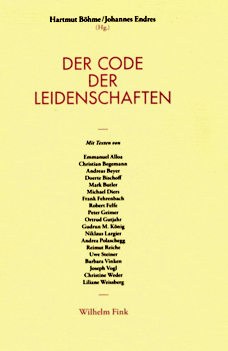 2017, Suhrkamp Verlag (Taschenbuch Wissenschaft): Frankfurt M.
This volume brings together key contributions from the history of fetishism as a cultural practice, discourse and concept. Texts gathered here stem from a variety of fields and disciplines, including ethnography, anthropology, religious history, sociology, the critique of commodification and consumerism, psychoanalysis, gender studies, aesthetics, semiotics and epistemology. These texts, and their selection and presentation in this book, are concerned with a number of questions, which are crucial to the history of fetishism since the 18th century up to the present: Which forces regulate peoples’ relationships to their favorite things? Does the veneration of a piece of clothing repeat an archaic disposition from a remote religious past? Is the commodity fetish a descendant of the idols of the so-called indigenous peoples? Or is the existence of the fetish only owed to the derogatory and misconstrued views of an opaque and alien ‘other’ (the ‘primitive’ people, the childish mind, the bourgeois economy, the pervert)? All texts are carefully introduced and linked to each other through commentaries by the editor, which outline major trajectories of one of the oldest fascinations of humankind – that with the seemingly meaningful objects that it surrounds itself with. 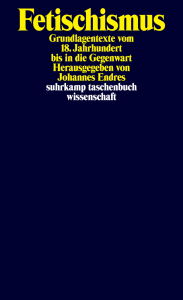 Friedrich Schlegel Handbuch: Leben – Werk – Wirkung (Friedrich Schlegel Handbook: Life – Work – Reception), Stuttgart: J.B. Metzler, 2017. Friedrich Schlegel’s life career, from his revolutionary youth over the Jena years up to his catholic conversion, serves as a mirror of the Romantic era as a whole. His theoretical writings laid the groundwork for the idea of Romantic poetry as a “progressive universal poetry”; his historical-critical method helped to establish ‘Literaturwissenschaft’ (literary studies) in the way it is still practiced today. 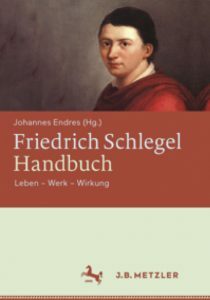 This handbook presents Schlegel’s oeuvre in its entirety, covering, besides his literary and aesthetic writings, his texts and fragments on classical studies, philosophy, the history of European and world literature, history and politics, and art history, including his many-faceted activities as editor, journalist, and prolific letter writer. Additional chapters address terms and ideas pivotal to his work at large, such as Fragment, Irony, Wit (“Witz”), Mythology, Revolution, and Incomprehensibility. The book, which features contributions from internationally recognized Schlegel and Romanticism scholars, is the first comprehensive reference work on one of the most influential spearheads of European intellectual history. European eighteenth-century discourse saw the advent of two concepts, which have been central to our understanding of man’s relationship to the world and himself ever since: the proclamation of the autonomous artwork and the stigmatization of un-enlightened attitudes towards reality as ›fetishistic‹. The book argues that this is not a coincidence. 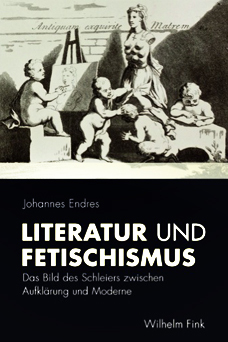 Thus, it explores the discourse on and the phenomenon of fetishism in its major historical manifestations in ethnology, religious philosophy, social and economic theory, and finally psychoanalysis from the eighteenth to the twentieth century. Particular interest is paid to the metaphorical transfer of the veil motif between images and text, including the comparison of both media in the history of aesthetics from Lessing over Kant, Hegel and Nietzsche up to Benjamin and Warburg. The history of modern art thus appears as a revision of a teleology that implies an evolutionary escape of man from its fetishistic beginnings. 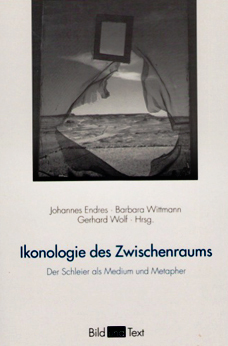 This volume gathers the proceedings of the conference “Veil: Image, Text, Ritual”, co-organized with Gerhard Wolf at the University of Trier in 2001. Its contributions discuss the veil as an artistic motif, a literary metaphor and an episteme in aesthetics, ethnology, anthropology, philosophy, social and political sciences. Both conference and book brought together specialist from various fields to explore the changes and continuities of representations of the veil. The contributions are tied together by conceptual essays from the editors, which highlight overarching aspects such as textures of opacity, allegories of seeing and reading, thresholds between media, and specters and their garments‹. Conference and book realize a fruitful collaboration between academics from literary history, art history, philosophy, and beyond. Kleist scholars tend to imagine the author as the paradigmatic exponent of a tragic mind. The shadows of his tragedies in life and literature seem too heavy and gloomy to leave room for comic tendencies. Although Kleist’s two comedies have always been acknowledged as true highlights in the history of the genre, his comic “strategies” – as well as their precedents from Lessing to Freud – have mostly been ignored. However, with such strategies in mind, the author’s situation appears as one in which the demands of an idealist worldview provoke a retreat to the limited and reduced formats of comedy. Kleist’s massive ›struggle with Schiller‹ – his predominant role model and antipode – is here reexamined in the light of a general struggle to avoid tragic inevitabilities.